Beebe Healthcare is proud to recognize Mike Simpler, Telecommunications Specialist with Beebe’s Information Systems department, as the August Living Our Values Every Day (L.O.V.E.) Letter Award recipient. 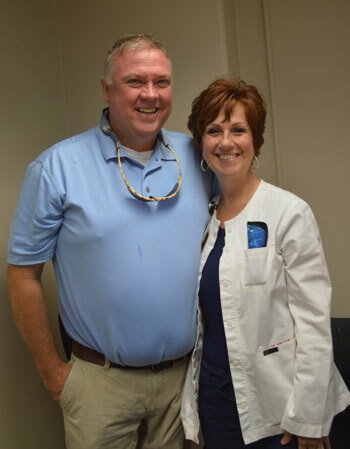 Mike was nominated by Denise Larson, RN, a nurse with Beebe’s Wound Healing & Hyperbaric Medicine department. Denise had reached out to Mike to set up her new phone. However, she was concerned that a very special voice message from her old phone would be lost. Mike was very understanding of her concern and how special the voice message was to her. He worked diligently to follow the Beebe values of treating each individual with respect and dignity and building trusting relationships with compassion and kindness. Mike acted with passion and love for others to make a difference. He is dedicated to being an expert in his field – always learning, always growing. Jeffrey M. Fried, President and CEO of Beebe Healthcare, and Rick Schaffner, Executive Vice President and COO of Beebe Healthcare, were on hand to make the presentation and congratulate Mike. Mike Simpler, left, shown with Denise Larson, RN, received the August L.O.V.E. Letter Award.